The Holocaust has long seemed incomprehensible, a monumental crime that beggars our powers of description and explanation. Historians have probed the many sources of this tragedy, but no account has united the various causes into an overarching synthesis that answers the vital question: How was such a nightmare possible in the heart of western civilization? In How Could This Happen, historian Dan McMillan distills the vast body of Holocaust research into a cogent explanation and comprehensive analysis of the genocide's many causes, revealing how a once-progressive society like Germany could have carried out this crime. 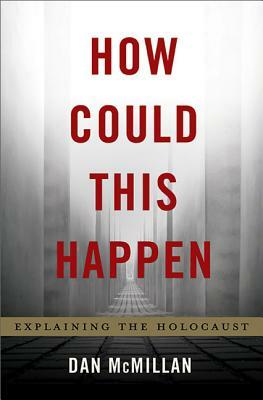 The Holocaust, he explains, was caused not by one but by a combination of factorsfrom Germany's failure to become a democracy until 1918, to the widespread acceptance of anti-Semitism and scientific racism, to the effects of World War I, which intensified political divisions within the country and drastically lowered the value of human life in the minds of an entire generation. Masterfully synthesizing the myriad causes that led Germany to disaster, McMillan shows why thousands of Germans carried out the genocide while millions watched, with cold indifference, as it enveloped their homeland. Persuasive and compelling, How Could This Happen explains how a perfect storm of bleak circumstances, malevolent ideas, and damaged personalities unleashed history's most terrifying atrocity. Dan McMillan holds a Ph.D. in German history from Columbia University and a law degree from Fordham University, and has worked as a history professor and a prosecuting attorney. He lives in New York City.